117 Graded stakes wins or places under the first four dams (36 G1 wins or places). 94% starters averaging 23 starts in the 5 cross pedigree. Multiple graded stakes winner, Grade 1 stakes placed earner of over $670,000. Cecil Seaman & Co. purchased Blueskiesnrainbows at the Keeneland yearling sale based on his biomechanical measurements and consistent family tree. He has all the characteristics that make a great stallion, and we are pleased to recommend him to you. Cecil Seaman & Co has been evaluating horses biomechanically for over 40 years. Our database has over 113,000 horses, including over 2,200 Grade 1 winners, plus hundreds of champions and millionaires from around the world. We use a unique Five-Step mating system to match mares to stallions, and identify mares that have the highest probability of producing graded stakes horses. Blueskiesnrainbows will stand for $2500 at Sunlight Farm in Sallisaw Oklahoma for his fourth season at stud in 2019. His first foals are yearlings in 2018 and look outstanding while averaging over five times his stud fee at the fall sales of 2018! 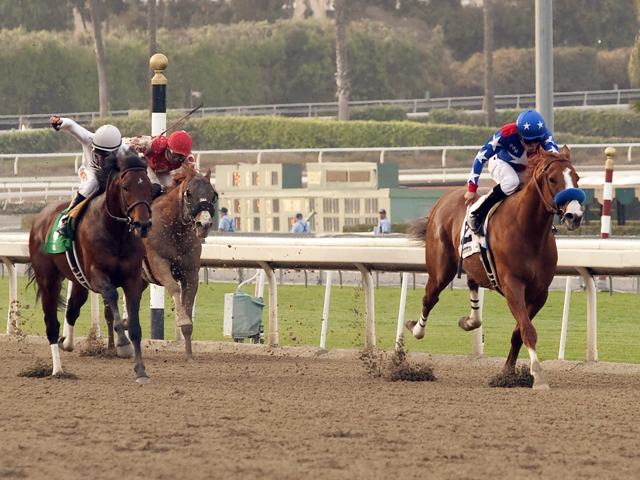 The Oklahoma Bred Program offers some of the best in racing purses and programs in the nation. 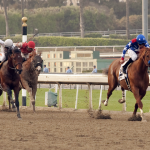 Oklahoma offers three tracks for thoroughbred racing. Blueskiesnrainbows’ foals will also be eligible to participate in the Breeder’s Cup races, ITOBA (Iowa) Stallion Stakes, and Oklahoma Stallion Stakes for added incentives. The BSNR team is excited to be a part of this great program in Oklahoma!